Verbs are the significant part of a sentence, without which a subject cannot make a sense in a sentence. Some verbs put subjects into motion while other verbs help to clarify the subjects in meaningful ways. In English basically there are three types of verbs, namely the action verb, the linking verb, and the auxiliary verb. They are divided into different types according to their functions and forms: regular verbs, irregular verbs, transitive verbs, intransitive verbs modal verbs etc. 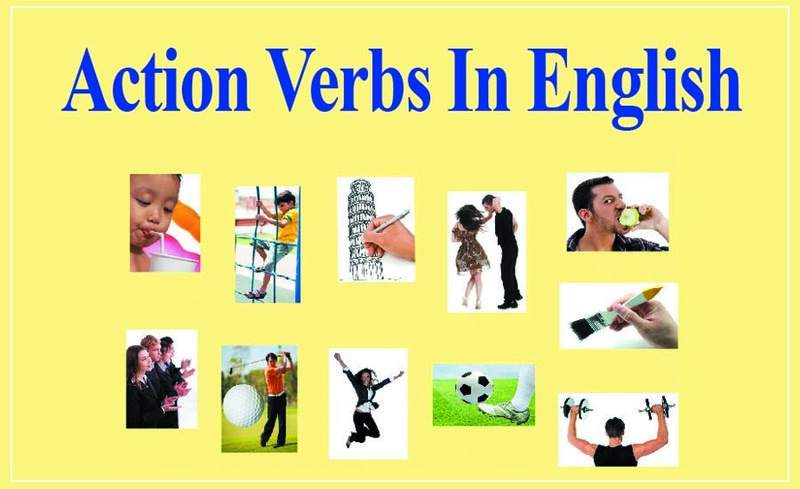 In this article we will learn what are action verbs in English. Definition: An action verb is a verb which is use to express a physical or mental action. The action verb tells us what the subject of a sentence or clause is doing and the action which is being done can be physical or mental. Here’s a list of common physical and mental action verbs below. Physical action verbs: run, write, wash, teach, play, typing, cry, sing, beat, brush, clean, exercise etc. They play well but usually lose the match. The teacher taught an interesting lesson to the student. My sister Zahra made a beautiful picture for the exhibition. I brush my teeth every night before going to bed. He was dancing around and singing at the top of his voice (=very loudly). Mental action verbs: love, think, smell, hate, want, believe, trust, hope, chance, luck, know, realize etc. The mother loves her children. She was chancing her luck driving without a license. The exam went better than I’d dared hope. I guess I really lucked out when I met her. Action verbs can be transitive and intransitive verb. Le’s play pirates. ( Pirates receives the action”play”). He was singing softly to the baby. (baby receives the action “singing”). Intransitive verb: Conversely w the intransitive verbs do not need a direct object in order to complete their meaning but in fact they are action verbs. These verbs can be followed by an adjective, adverb, preposition or verb complement (gerund or infinitive). The bomb exploded in the city center (exploded is followed by preposition of place with no direct object). Seagulls followed the boat, crying loudly (crying is followed by preposition of place with no direct object). On the other hand some action verbs can be both transitive and intransitive depending on their meaning. He brushed the dirt of his jacket (brushed is transitive verb). She brushed past him. (brushed is intransitive verb). Remember action verbs can have present tense, past tense or future tense. Do you know his address? (present tense). I knew where he was hiding. (past tense). You will know about the system of a language if you study grammar (future tense). Action verbs can have different forms for different tenses to construct your sentence properly you must know about the different forms of action verbs.